One of the major problems connected with preheating of Prebake and Söderberg cells has been to maintain an even and secure heating sequence of the furnaces. This and a constant supervision, adjustment of the burners during the heating sequence have sometimes made this unnecessarily costly. Industri-Teknik has after careful studying and extensive tests come up with a solution, the APS, which will take away all the problems that have been surrounding the preheating of aluminium cells. The system is, compared to others, easy to handle, specially designed for this purpose, much lower in fuel consumption and with a low acquisition cost. The wagon consists of two compartments with a gas-proofed wall between them. 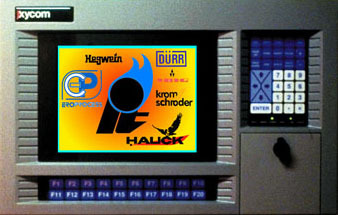 One of the compartments contains the electrical cabinet with the control equipment needed to run the system, burner management system, pulse firing system and a computer that controls and supervises the heating sequence. In the other compartment is the part of the gas train that will decrease the pressure to a useable level for the rest of the system (150 mbar). The system can be delivered with or without a vaporiser, capacity 50/100 kg/h. In the stainless, easy to move trolleys, one for each burner, we have placed the valves controlled by the burner pulse control unit. It is here the gas and the combustion air is guided and controlled. 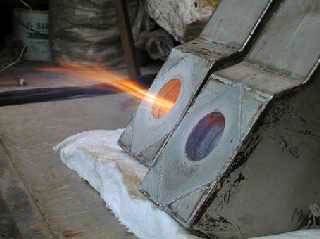 The burner and its design have carefully been tested to achieve maximum capacity. Together with the pulse firing system it is possible to get an even and secure heating and circulation in the cell. The ceramic tiles have a 90 degree outlet angle in the quarl. The combustion air is either provided by compressed air, which means that no blower is needed or by a blower. 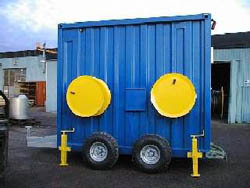 The size and capacity of the burners can of course be specially fitted to each and every project. The panel should be placed as near the cell as possible. It is equipped with alarm and indication panels for the burner control and with 6 indicators, one for each measuring point. These values are transferred by cable (RS-485) to the computer that will compare and transfer the highest value to the program controller. The heart of the system is the computer and the automatic/pulse burner control. This is gathered in one place to make the system easy to work with and easy to supervise. Through a number of pictures on the viewing screen you will be able to guide, supervise and change the heating sequence. In the “Process Picture” you will be able to see among other things all present temperatures, highest temperature, set point, alarms and which valves that are opened and in which phase the burner is pulsing. The program will l og and create a report that later on can be used for different purposes. The program also register every eventual stop and hold during the running of the heating sequence, it will automatically compensate for all eventual stops during the later phases of the heating sequence, if you have chosen to pre-set your end-time of the heating sequence.